Wolves are members of the canine family, but they’re not exactly domesticated like your average German shepherd. Though numerous subspecies of wolves exist, scientists and researchers have recognized four distinct species: gray wolves, eastern timber wolves, Ethiopian wolves and red wolves. With habitats from Alaska to the highlands of Ethiopia, these wolves remain some of the world’s most recognizable predators. Gray wolves are the quintessential image we picture when we think of the species. Historically found throughout the entire northern hemisphere, these endangered carnivores are now mostly confined to the tundra, forests, grasslands and deserts of the US and Canada. A peripatetic species, gray wolf packs can cover territories that range from 10 square miles to 1,000 square miles, and they can do so for quite a long time. Members of the pack can live for 8 to 13 years in the wild and more than 15 in captivity. The eastern timber wolf has long been classified as a subspecies of the gray wolf; however, a 2012 genetic study by the U.S. 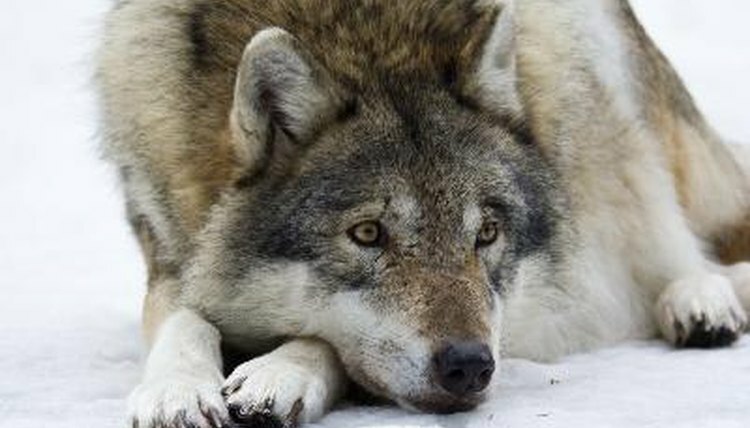 Fish and Wildlife Service in the journal "North American Fauna" has suggested the eastern timber wolf is its own distinct species. These wolves live in packs in remote regions of Canada and Alaska, but a small number live in the northern forests of Minnesota, Michigan, Wisconsin, Montana, Idaho and Washington. Like gray wolves, eastern timber wolves are always on the move and tend to go wherever their natural prey goes; they occupy areas of forests, open fields, brushy swamps, rivers and streams alongside their natural prey: deer, moose and beaver. Indigenous to the Ethiopian highlands in Africa, the Ethiopian wolf is smaller than its cousins and more closely resembles a jackal than a gray wolf. It is listed as an endangered species and holds the title of the rarest wolf species in the world; only around 500 adult Ethiopian wolves exist today. These wolves prefer to live in isolated Ethiopian mountain ranges where rodent populations are high and grasses are low, making hunting a bit easier for the pack. The endangered red wolf originally populated the southeastern United States through the Ohio River Valley and even as far north as Pennsylvania. These reddish beauties are now primarily confined to national wildlife refuges and a 1.7 million-acre restoration area in their native North Carolina. As social animals, red wolves prefer to live in packs, with pairs often mating for life, in forests, swamps and prairies. They often build their dens in hollow trees, stream banks and sand knolls. What Are the Five Species of the Brush-Tailed Possum? Where Do Timber Wolves Live? What Kind of Habitats Do Wolves Live In?